Fancy Pants is having a Valentine's Day card contest so I whipped up this card during nap time today and wanted to share. 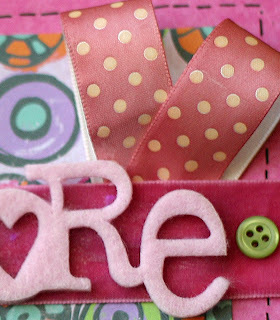 The papers, ribbons and felt are all Fancy Pants Designs. The little letter stickers are Making Memories, the buttons are Autumn Leaves and the faux rub on stitching is Doodlebug Designs. What a cute card! Good luck on the contest!!! Your card looks great, Rebecca! total cuteness!! 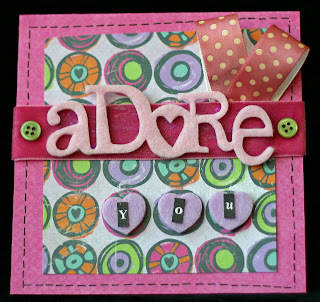 I love this card and how you shaped the ribbon to look like aheart! too adorable! During nap time... really?? Your making me look bad. :) Just kidding... its really cute! Hope you had a good V-Day with the family!